Image caption The chief of the UN mission, Guillermo Fernandez said the group would continue monitoring Nicaragua remotely. The government of Nicaraguan President Daniel Ortega has ordered a team from the United Nations Commission for Human Rights to leave. The expulsion comes days after a critical report into human rights in Nicaragua during months of anti-government protests. 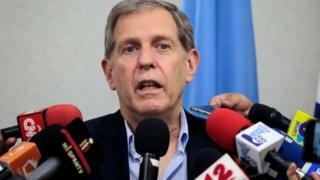 The chief of the UN mission, Guillermo Fernandez, said his team would continue to monitor the situation from abroad. More than 300 people were killed during the recent political unrest. The report released on Wednesday by the UN High Commissioner for Human Rights called on the government to stop the persecution of protestors and disarm masked gangs who it alleges are responsible for killings and arbitrary detentions. It also described the torture and use of excessive force using interviews with victims and local human rights groups. For its part, the government said the report was biased and ignored attacks by protesters on members of the governing Sandinista party. President Ortega had invited the UN team to help monitor a national dialogue process between the government and the protestors which stalled. He said earlier this week that the UN had overstepped its authority and was violating Nicaragua's national sovereignty.